I think I’m part Irish or maybe really I just like to think I am. I know my Dad’s side of the family come from Switzerland and Germany and my mother’s maiden name of Vaden is English…but I’m not sure about her mother. My Grandmother Vaden was the diametric opposite of my beloved Grandma Bathe; where one was warm and loving; she was more stern and sometimes downright scary. My Grandma Lizette was a wee little thing but Luda Vaden was a towering presence and I’m sure where some of my own height came from. Still if she had Irish genes it makes sense because I see the Irish as tough people; able to survive against sometimes insurmountable odds and I do believe Grandma Vaden persevered through tough times. I can’t deny that some of what I love about the thought of being Irish is just how much I love Irish food. I’m not sure the Irish would think my love of the Reuben sandwich qualifies for it’s a totally American invention out of Nebraska but I do love some great corned beef, the delicious boxty at Fado’s Irish Pub here in Denver and this truly Irish dish of Colcannon which combines mashed potatoes with a mirapoix mix, cabbage and bacon. There’s a lot to acknowledge in this post, several things that came together to see this dish come to fruition. It was inspired by the receipt of some Concannon Irish Whiskey. 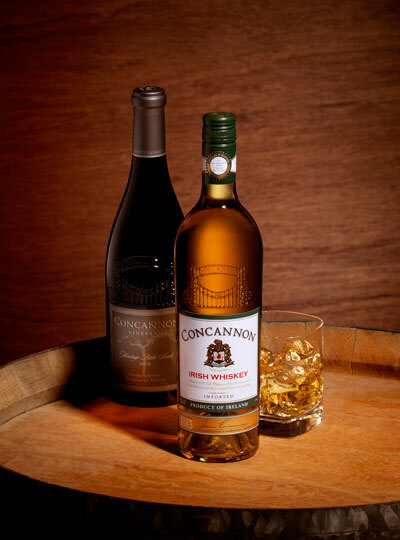 Concannon Irish Whiskey was developed as a collaboration between Livermore Valley-based Concannon Vineyard and Ireland’s Cooley distillery. Distilled and blended at Ireland’s only craft distillery with American consumers in mind, this special project is a unique expression of Concannon’s American and Irish roots. A refined blend of malted barley and corn, Concannon Irish Whiskey is craft distilled then matured in bourbon barrels for a minimum of four years. Petite Sirah wine barrels are transported from California to Ireland, where a portion of the whiskey is then finished for four months before blending. Known as ‘the Concannon Effect’ this gives Concannon Irish Whiskey a uniquely fruity character that allows this whiskey to stand out from the crowd. With a full, clean taste delicately balanced between honey sweet, citrus and malt flavors, and a fresh oak finish, Concannon Irish Whiskey can be enjoyed neat, on the rocks or in a variety of premium cocktails. Of course I thought it perfect to use in a whiskey marinade for steaks to be served with colcannon for St. Patrick’s Day and it was perfect. The beef is another story altogether. I was invited as a member of the media to attend a symposium a couple of months ago that was put together by staff at Colorado State University titled ‘Beef + Transparency = Trust.’ It was a program that provided in depth information to a wide range of people in our state including restaurateurs and media people involved with food the chance to both see and hear about cattle production in the state of Colorado and meet people intimately involved with that production, from the cattle ranchers to the feed lot managers to the ultimate beef processors. I left that day with a heightened sense of awareness about the entire process and a great deal of respect for the people involved and their dedication to the roles they play in providing beef to consumers. 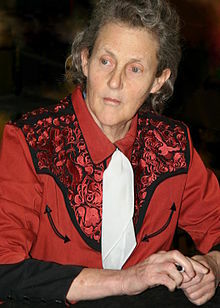 My intent had been to provide a detailed story about that invent which was highlighted by the appearance of Dr. Temple Grandin; a most amazing woman and one who not only loves a great steak but is passionate about seeing that the animals who provide us with that resource are treated humanely; it is her life’s work. We were also blessed that day to hear from Sara Shields, a fourth generation Colorado cattle rancher who shared with us the very personal side of cattle ranching and her love of what they do, filled with both hard work and compassion, it brought some of us to tears. I wanted to find some Colorado beef, talk to a rancher and make a dish for the blog before writing a comprehensive article but life has thrown me a curveball I did not expect so I’m going to punt if you don’t mind. I invited my friend Karen from the Savoury Table blog to join me and she wrote a post that is informative and filled with not just great information but also mirrors my feelings about some aspects of what it takes to get beef to our table. I hope you will visit Karen’s blog and become more educated as well and if you take anything away from what we learned that day I hope it is the recognition of how people in this industry care deeply about the food that goes on our table each day. That sense was only furthered by personally meeting a couple of Colorado cattle ranchers. I had asked my contact at CSU for a recommendation for a local rancher that I could get in touch with; I wanted to cook with some of their beef before writing a story. I met two men that both brought that same level of commitment that we saw in Sarah; a true passion to work the land and raise cattle and do it well. Karen will be doing a guest post for me next week featuring one of them but today I want to talk about meeting Todd Inglee with Ralston Valley Beef. Soft spoken, warm and so passionate about what he does, I seriously could have talked to Todd all day long; I’ve definitely gone from totally uninformed to feeling like I have a much better knowledge of some of the aspects of cattle ranching in Colorado; especially a smaller family organization like Todd’s. Ralston Valley Beef headquarters are out of Arvada, Colorado; north of Denver in the Ralston Valley. Cattle in their program come from two Colorado ranches: one located in the mountain meadows of Clear Creek County and one located in the grassy plains of Lincoln County. Intimately involved in the stewardship of their cattle, I learned even more about the differences in the way cattle are brought to market; Ralston Valley beef are grass fed and finished with grain; providing what many believe is the best combination of great taste and the right amount of marbling. For more information about the different types of beef and the requirements to be called grass fed and/or organic, be sure to read Karen’s post. Todd had stopped by with some samples for me to try and I prepared some of his beef using this recipe for one of the meetings of our local blogger group; not only was it amazing, but as luck would have it, Todd was back in Denver that morning and wanted to bring me something else so came by as we were wrapping up. He met some of my friends; we met his charming boys and I love that he and his kids all got to sample some of their beef I had prepared . When a cattle rancher says you prepared beef perfectly, well I think I blushed because that was the best compliment ever! My hope is to one day visit a ranch and write my own story but today I must share with you this recipe. Todd’s Ribeye steaks combined with an amazing whiskey sauce using the Concannon Irish Whiskey is accompanied by the aforementioned Irish dish of Colcannon. I may have tried this early but I will be doing it again for St. Paddy’s. It is a definite an ‘Oh My Yum’ moment. I do worry that Todd has spoiled me a bit. Seriously and amazingly tender beef. This was a fantastic meal; I might have even enjoyed a Guinness on the side! 1 pound bacon, cooked until crisp and crumbled, save a bit for garnish. Melt the butter over medium heat in a large skillet. Add the onion, carrot, celery and bay leaf to the pan. Saute until the vegetables are tender and translucent; approximately 10-15 minutes. Add the garlic and saute another minute; remove the bay leaf. Add the shredded cabbage and saute until tender but still crisp. Boil the potatoes in salted water until tender (depends on size; start checking at 15 minutes by piercing with a fork; it should easily penetrate the potato). Drain thoroughly. Add sour cream and butter and mash to desired consistency (I like mine rustic so I leave the skin on and smash more than mash). Fold the cabbage mixture, green onions and bacon into the mashed potatoes. Put all the ingredients except the steak into a small saucepan and warm until the sugar is melted. Put steaks and marinade into an airtight bag or container and massage marinade into steak; refrigerate for 2-6 hours. Remove steaks from marinade and either pan fry in a combination of olive oil and butter or cook on the grill. Allow to rest for 5 minutes if slicing. Place large serving of colcanon on plate and garnish with bacon. Top with whole steak or steak slices. What a wonderful opportunity, to learn about cattle ranching and grass fed beef. I admit, that I am not a whiskey drinker at all– I just can’t handle it. BUT, cooking with whiskey is something I do enjoy, because it imparts such a beautiful flavor. I agree, that you did a beautiful job with these rib eye steaks. It’s mouthwatering, for sure. Then you pair it with Irish colcannon, which is definitely one of my favorite side dishes. Well played. I’m glad I remembered it; steak is now on the grocery list! You are too sweet; thanks a bunch! This colcannon is such a favorite I quit making any others…had some this morning I fried as a potato pancake. YUM! Mmmmmmm, that looks AMAZING! And what a BEAUTIFUL post! Thank you Jacqueline and it is. Amazing. Five pounds of potatoes made a LOT and I’m still loving the leftovers. Made a potato pancake this morning for breakfast; yes, that was good too! wow, this looks so delicious, Barb!! 🙂 YUM, YUM. Oh yum. This looks like the perfect meal to me. I love colcannon made with leftover ham too. You just can’t go wrong with this combination. Now I’m really in the mood for St. Patrick’s Day. Shoot…I should have given you some today; 5 lbs makes a LOT of colcannon! Temple Grandin is amazing – pretty cool to attend an event where she spoke. And this steak looks amazing too! Irish whiskey is nice, and although I’ve never tried it with steak, I’m sure it’d go quite well. Great idea to add bacon to colcannon, too. Thanks for this. She was literally a real kick John. Loved seeing her speak. Being Irish, this meal calls my name but Irish or not I’m sure everyone who lays eyes on it will fall in love. This sounds like an amazing, deeply satisfying meal. I love colcannon and have never made it at home. I don’t know why but I do know that I will make it now. This meal will be made this week! I wish we were neighbors I would give you half of mine! So good but 5 lbs is really a company dish huh? You know how much I love everything Irish. Irish food, Irish whiskey, Irish people. This is an absolutely perfect tribute to my ancestral home! Oh my goodness. Yum Yum. My favorite type of steak and the most excellent sounding colcannon that I’ve seen. I’m trying this for sure. One question….how many people would this recipe serve? Well, the colcannon recipe I’ve always used calls for 5 lbs of potatoes; that’s a LOT of colcannon, much more than necessary to server the folks who are getting fed from 1.5 to 2 lbs of meet. So I would halve it for 4-6 and for the full recipe say 8-12. Ok, so this is taking Irish food to a “whole “nother level”. 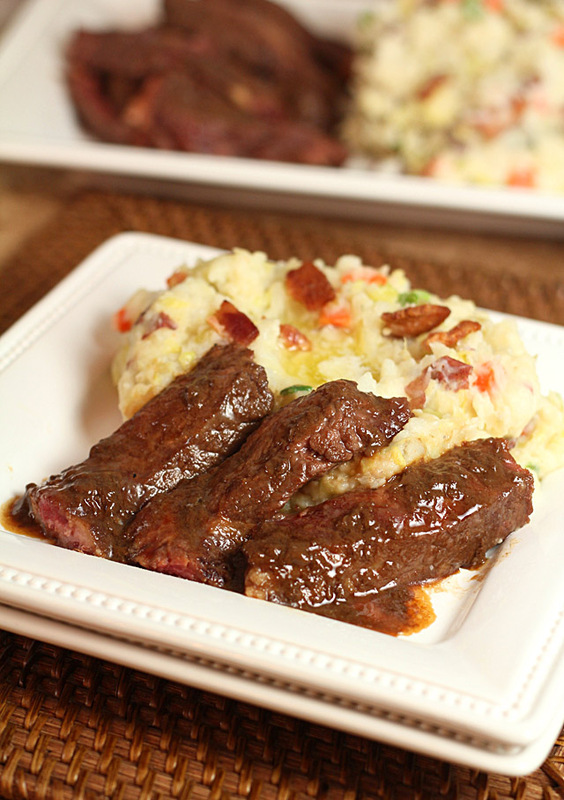 Wow, I can almost taste it – may just have to change my St. Patrick’s day menu to this one!!! Barb, quick question, where can I pick up a bottle of that beautiful Concannon Irish Whisky? I called my local store, Parker Payless Liquor and sadly, they don’t carry it. Any Denver area liquor stores you know of that carry it (or close to south Denver…GV, Highlands Ranch, Lone Tree…)? I am chuckling…I found a product locator on their site and seems it has not yet made it to the shores of Colorado! I can offer you one of my sample bottles if you want to trek over here; near the Tech Center. Or just use Jamison; it’s different but in this application probably less evident than if making a cocktail. I have been looking forward to this post all day! Thank you for sharing this with the world. Cannot wait to make this over the weekend. DELISH! I came to see the food, but so enjoyed your post. My husband is from Ireland… I may have to fix this dish as a surprise! I can’t remember trying colcannon on any of my trips to Ireland to visit my husband’s grandmother. The potatoes were nearly always boiled at her house. Tasty but this would have been an improvement for sure! Karen told me it’s also well know in England…surprise your hubs? Exceptional is all I can say Barb! the Colcannon looks out of this world, I must make this for my British Hubby 🙂 Thanks so much for this timely post. Why yes you must! It would be perfect for him, certainly a dish served in England as well according to a friend who lived there. What an honor to hear Temple speak. Her work to raise awareness and change practices in the cattle farming industry it truly amazing. Hats off to you for taking the time to get to know some of your local ranchers and learn not only how hard they work but often the passion that comes along with it! BTW, this looks amazing! 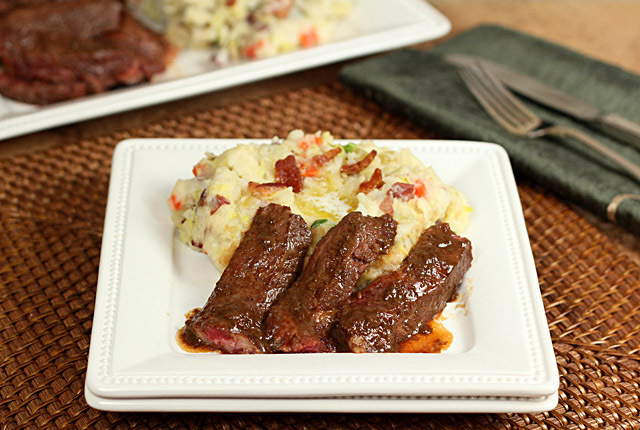 I’m a sucker for all things cabbage and bacon …..especially over a good steak! It was a wonderful event and she is a kick and a half. No filter for sure; one guy was taking photos, she stopped speaking and pretty much told him to stop. SO glad it wasn’t me! LOVE the potato-cabbage and bacon combination. It reminds me of the Catalan dish Trinxat. Soo good!